Spain was the leading power of europe during the 16th and 17th centuries. During the age of discovery, Spanish rulers sent expeditionsto the west in search of riches. The spanish Opened up new trade routes across the oceans. Imperial set the standard for the european colonization period. Spanish explorers brought back information and goods from the new world that would revolutionize the european economy and the meathods of global buisness. Spanish rulers were motivated by the discovery of riches in distant lands. Commisioned explorers were searching not only for treasure but for glory for themselves and their families. Imperial spain set the standard for european colonization. 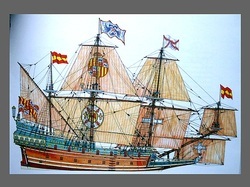 The spanish navy carried explorers across the atlantic to the Carribean and the mainland. A spanish Expedition that sought a western passage across the atlantic, lead by christopher columbus, began the era of trans-atlantic trade. The Spanish Galleon evoled from the Carrack as a multi-perpose warship. It was a faster and more manuverable vessel which was often outfitted with cannons. The Galleon was cheaper to manufacture than it's predecessor making it a more worthwhile investment. Being a multi-role ship they were used widely by european states. the most famous example being the spanish treasure fleet which transported goods from the americas across the atlantic to european markets. The superior manuverability and cargo capacity of the Galleon made it one of the most important ocean going vessels for exploration and trade of its time. Spanish Naval reconnaissance was very important to the devolopement of a worldwide trade network. The Trans-Atlantic trade routes Are still in use today by cargoships and oil tankers. Spanish reconnaissance lead to the colonization and developement of the Americas. the economic explosion that resulted from this major discovery was crucial to the birth of the modern age in that it connected the entire world into one global field.